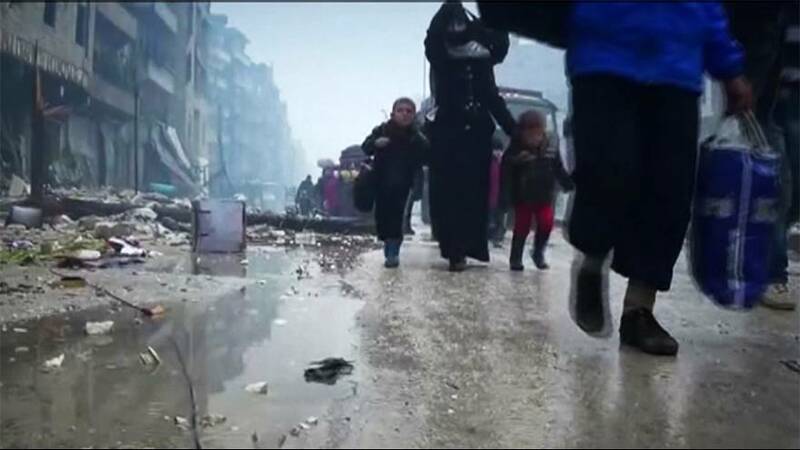 The governments of Syria and Russia are presenting a very different picture of the crisis in Aleppo from that portrayed by the UN, as the battle for the city draws to a close. Syrian state-controlled television showed pictures of civilians fleeing and soldiers helping them, as they seek shelter. “We are securing vehicles to move them forwards until they can manage by themselves,” said Nazzal Mohammad of the Syrian military. The Syrian army has denied carrying out killings or torture. In Moscow, media quoted praise from Russian Defence Ministry Spokesman Major General Igor Konashenkov for a ‘successful and humane’ Syrian operation to liberate the east of the city. He was also quoted as saying on Tuesday that militants have produced staged videos showing ‘Russian bombardments’ in Syria. To illustrate claims that the rebels ruled with a reign of terror, a mother, fleeing with her son, showed injuries on his back to Syrian TV. “Look at his body! Why are we coming? Why are we coming here? Because we wanted to get rid of them…They would not let us go,” she said. Russian media also presented images of Aleppo residents “celebrating the impending liberation of their city”. More than 100,000 civilians were held “hostage” as human shields in Aleppo by “terrorists”, the Russian defence ministry spokesman is quoted as saying by the Tass news agency. They left for Syrian government-controlled areas, he says, as soon as the opportunity presented itself.